When we think of the topic of inspiration, we often think of beautiful scenery, waterfalls, mountains, streams, etc. It is our natural environment and it is aligned with inspiration. The world we live in is defined by boundaries: yard boundaries, fences, walls, gardens with defined borders, paths with clear edges, international borders. Most of us spend the majority of our time surrounded by man made walls, concrete paths and grasses that are cut to a length that keeps most wildlife from surviving near us. These boundaries have functioned for the advancement of our species, but they are not inspiring. Boundaries make transcending the limitations of in-the-box thinking difficult. Our thoughts and actions tend to replicate the environment around us. 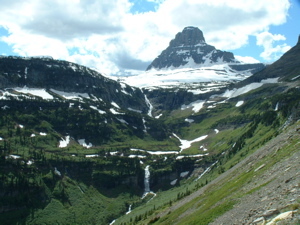 Can you find the boundary between the valley and the mountain in this breathtaking scene at Glacier National Park? Boundaries mark limitations, inspiration transcends limitations. It is free of boundaries. This is why spending time in the wilderness, breathing the fresh air, looking out over a beautiful vista and hiking through a rustic forest are so inspiring. Wilderness has no boundaries. The ground is messy, the boundary between the forests and meadow are jagged and dynamic. Everything is shared. Water, dirt, leaves, dead wood, seeds and even dead animals and bugs all share the ground and meld together to make a compost that no commercial process could match. Trees and other plants produce fruit that drops to the ground to be shared. 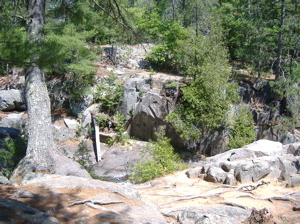 Tree roots in a rocky cliff at Dave’s Falls County Park, Marinette County, Wisconsin. When we spend time in the wild, especially alone, we are free of defined responsibilities or things that remind us of deadlines. The noises we hear are random. Our experience is unpredictable: wildlife, bugs, the occasional change in aroma from wildflowers, trees or skunks. We let go of control over the environment around us and allow God to decide what we might encounter. Time spent in the wild is priceless in our pursuit of spiritual growth. Regular nature hikes, camping trips, visits to the park, stepping outside for fresh air and even surrounding ourselves with pictures of natural landscapes all provide stress relief and bring us a step closer to God. I believe that wilderness experiences play an important roll in mental, physical and spiritual health, and that the preservation of the Earth’s natural environment is a crucial issue to which to speak. I have not make a habit of using this blog as an issues forum and do not intend to start now, but on October 15th, I will be participating in Blog Action Day. A day on which 5258 blogs (and growing) [15,568 19,734 as of 10/15/07] will be writing about the environment. If you are a blogger, consider doing the same. It may not be possible to change the world in one day, but there’s no doubt that an impact will be made. Register your blog at Blog Action Day and be included in their listing. If you are a blog reader, check out the listings of participating blogs at Blog Action Day.